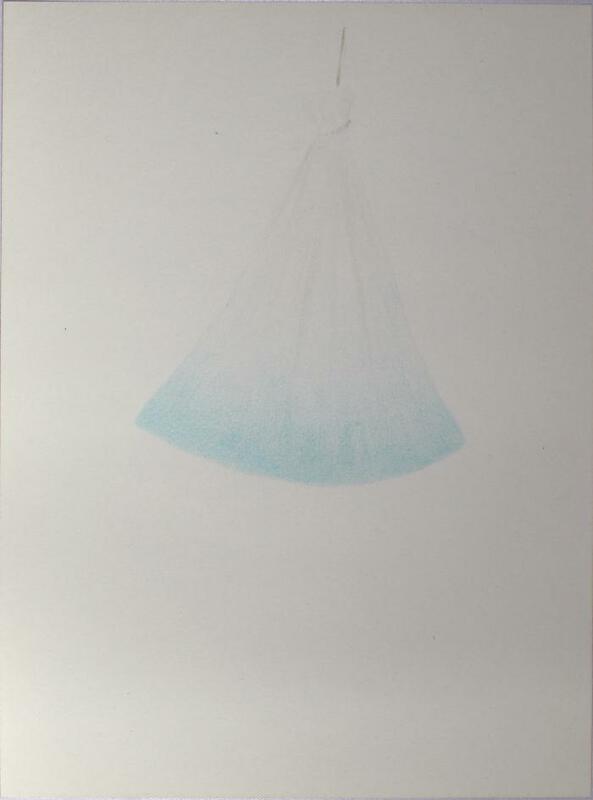 Lucile Bertrand, Study for Blue Hanging Bag, Colored pencil on paper, 11 in X 8.3 in, 2015. A child goes to visit a grandmother who lives far away, in another country. They had never met, although they very much wanted to. There were insurmountable political obstacles, but the situation finally changed and they were allowed to meet. A deep friendship was formed spanning generations and continents. They visited many more times. These two were among the lucky ones – for so many families such an opportunity never comes. Years later there surfaced a scrap of paper with a rather awkward drawing – a jagged line representing the border and soldiers with oversized guns on both sides. The child never talked about the experience of going through the checkpoints, the stretch of no-man’s-land, of officers in full battle gear with guns drawn, of delays in checking documents, and the palpable tension surrounding the travelers. The simple drawing fully conveys the gravitas of such situations that, tragically, seem to be ever-present realities of our world. However, journeys do not always have to be such traumatic experiences –some can be pleasurable as well. In the exhibition Travelers and Strangers, Lucile Bertrand expands her often explored themes depicting passages and journeys, the diversity of migration, and the socio-political complexities of borders. She explores the multiple reasons for departures and the vastly different expectations, goals, and experiences that result. The series of ten drawings, titled Two Directions, 2017, well documents her comprehension of the complex realities of mankind’s mobility. The high mountain area represented in the pair called North-South/South-North is for some the only existing passage to political, and even physical, survival, in spite of the dangers, such as posed to the Sudanese asylum seeker, who is one of the protagonists of this saga. His route, delineated by a red line, goes from Italy to France. 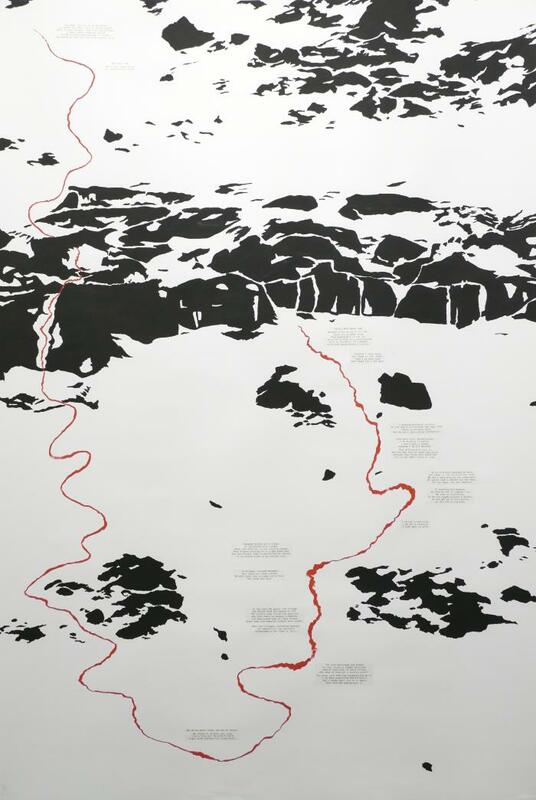 In a second drawing, another red line represents the boundary that had to be crossed in the other direction by more than 900 Italian Jewish people hiding on the French side of this same mountain, fleeing from the Nazi occupation of southern France in 1943. 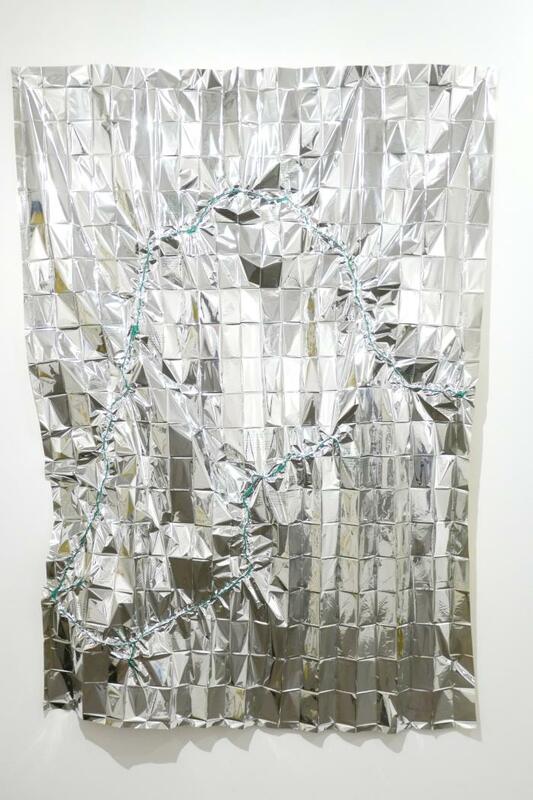 In Survival Routes/Touristic Routes, 2017, images are drawn on the metallic surface of a pair of survival blankets issued to refugees to shield them from cold or heat. 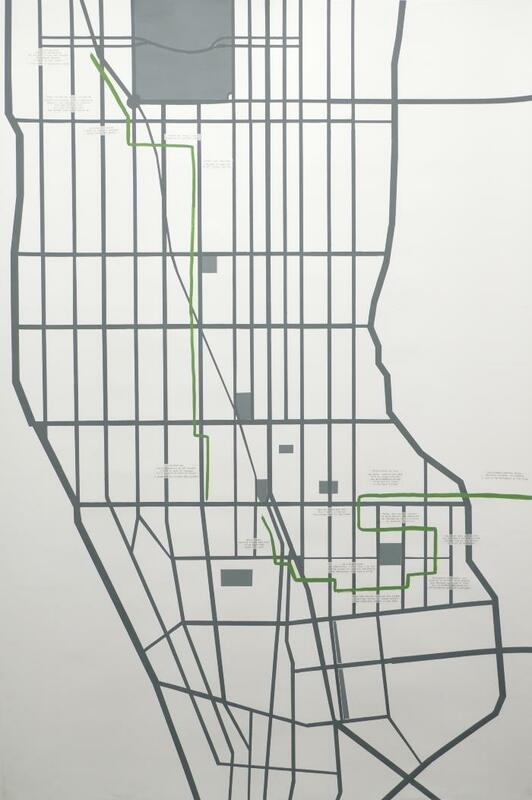 Again, the symbolism of the forbidding red line denotes the complex and difficult road while the green means an easy passage. Also displayed in pairs, one marks the dangerous journeys from South America to the United States, and the vacation journeys from the USA to Mexico. Another pair speaks about the route taken from war-ravaged Syria to Western Europe, possibly France, and that of a visitor from France to a peaceful Syria before the war. Yet another documents the complicated escape route of a 1938 Austrian political refugee to the USA and the 1998 return of the same protagonist to Austria, the country once again being in the throws of a right-wing political climate. Clearly the imagery based on the observation of actual maps and the creation of imaginary topographies plays a prominent role in Bertrand’s formal vocabulary. 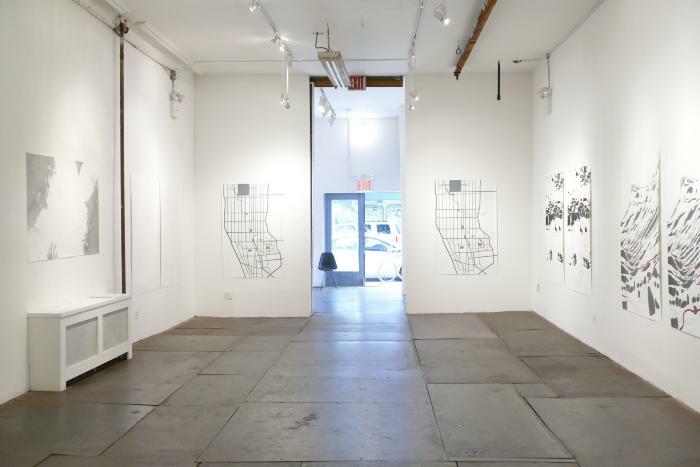 Her studies of the widest spectrum of large world and more intimate local maps, archival or current, are one of the tenets of the work. 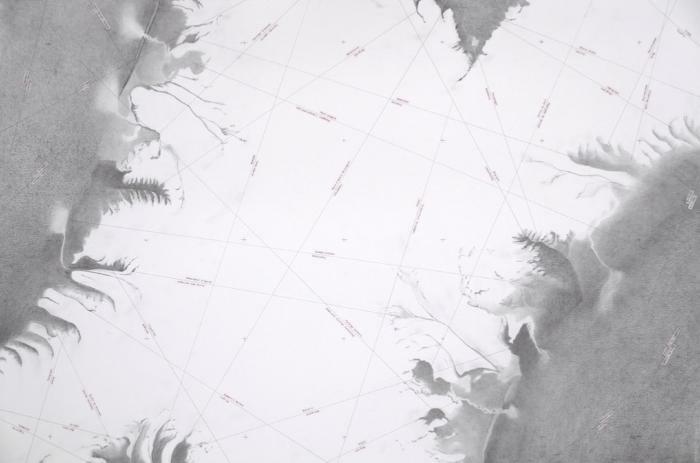 This is more than coherent considering Bertrand’s predilection for drawings, maps being essentially a compendium of lines delineating the topographical features of a place, attempting to collapse them from the existing three dimensionality into the two-dimensional idiom. First drawn thousands of years ago by the Chinese to navigate land and sea, they evolved not only into the most practical tools and many beautiful works of art, but also as a factor in political power games and economic exploitation. 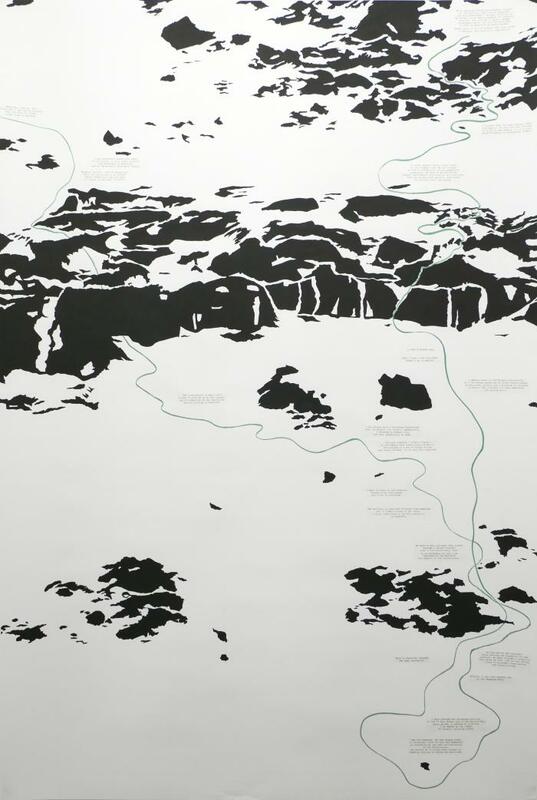 Ancient borders were primarily created by rivers, mountains, and oceans, then kingdoms and states redrew the maps, creating borders, asserting their power over the land, planting the seeds for the unending series of wars and conflicts, the likes of which the artist alludes to in her work. Lucile is a multifaceted artist – her deep interest in philosophy, history, and political science leads her to do a substantial degree of research before arriving at formal solutions for individual works. 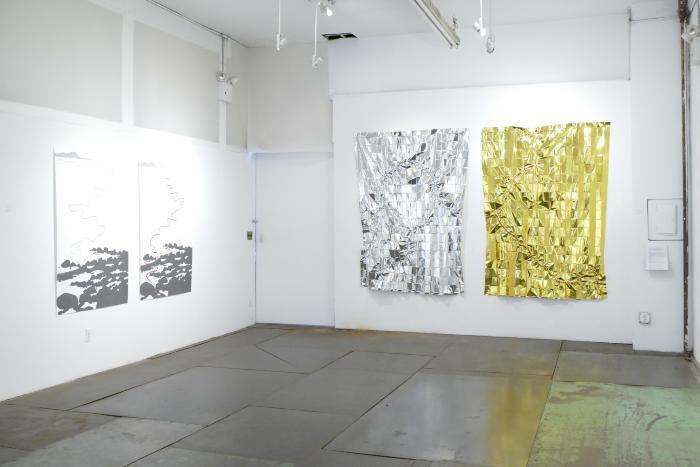 Be it large site-specific installations or studio pieces, she chooses the material that best serves to convey her initial idea. She frequently works with material that is mundane and perishable, such as feathers and fabric; very timely, as are the refugee blankets; or noble and enduring as are stone and earth. She creates numerous sketches, notes, and drafts. Her thoughts about her work are clarified by the polarity of the disegno interno – the inner design, the original idea or concept – and the disegno esterno, which is the physical manifestation of an idea, be it a quick sketch or a more detailed drawing. Bertrand’s complex probing into every aspect of her large-scale installations, for which the topography as well as the history of those portions of space are often the very impetus of the work, was well documented in the 2013 installation From Gent to Ghent at the Art OMI International Artists Residency in Ghent, NY. That piece pointed toward the often involuntary changing occupancy of the area, beginning with the Native Americans, followed by beaver trappers, then by settlers, first Dutch, later on English. She used varied materials such as fur, wool, cloth, and fishing hooks to emulate, on a small scale, the topography of the region. 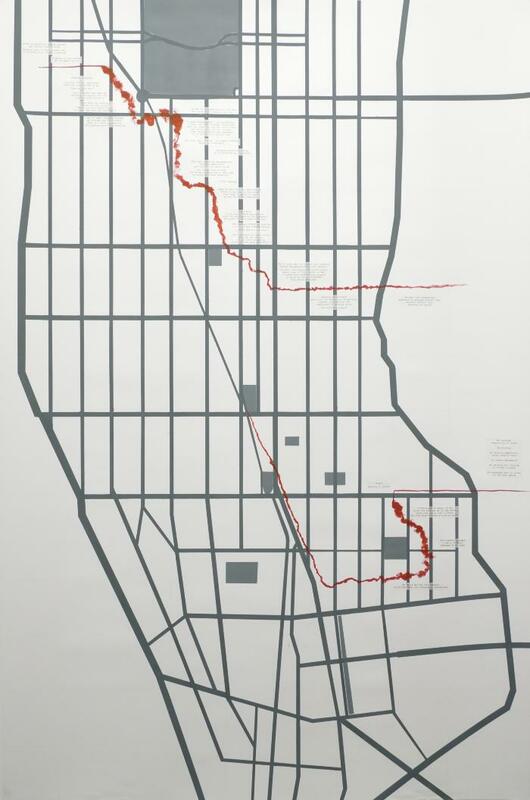 She followed maps and archival records, as the preparation for each piece is always based on a careful study of all available facts and information. 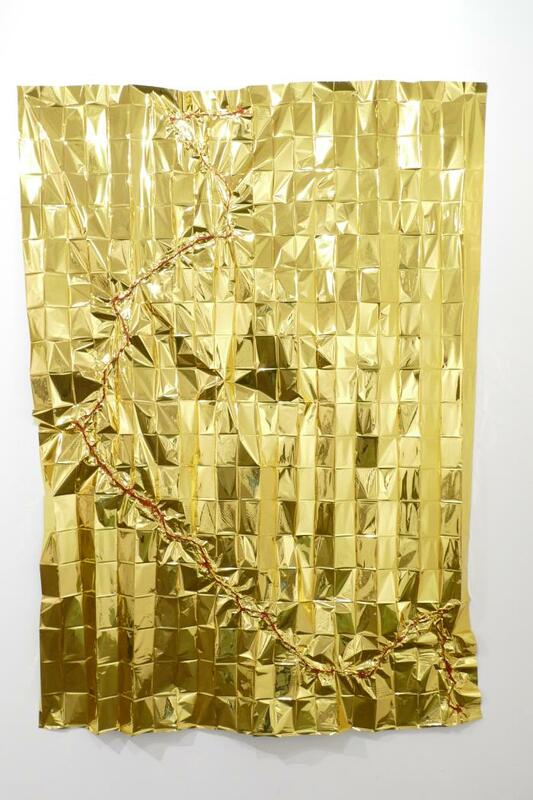 Lucile is also an avid reader – her piece Creole Gardens, 2017, is inspired by the writing of the poet, author, and philosopher Edouard Glissant. 3 She agrees with his vision of a form of globalization that would not erase the indigenous cultures, but incorporate them into a vast universe of traditions and customs thus creating a global culture of unprecedented richness and understanding. Creole Gardens is a truly site-specific project – created in Brooklyn expressly for the exhibition at Kentler, it is composed of photographs of gardens that are favorite places of participating Brooklyn residents. A short version of their family stories richly illustrates the diverse backgrounds of Brooklynites, and in turn points to the absurdity of the growing social and racial intolerance of our era. For the Native Americans who physically survived the Trail of Tears in 19th-century America there was no freedom at the end of the road. Forced marches of the barely living survivors of the European concentration camps at the very end of WWII spoke of inhuman suffering. Long lines of refugees winding their way through the desolate landscapes and ruined cities of the Middle East attest to the never ceasing brutality of man unto man. They leave footprints in the sand and the arid soil of the area as well as in our minds and hearts. 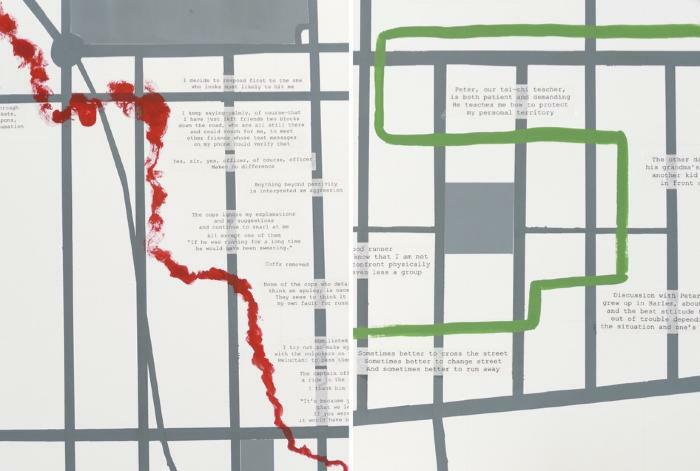 The artist’s overall interest in narrative – in work dealing with the visualization of memories, recollections, and revelations that result from probing into present and past events – is naturally followed by creating works in the form of books, and there are two such examples included in the exhibition. In Perpetratio, 2009, the artist utilizes collaged imagery drawn from a 2007 publication of the German magazine Der Spiegel that depicts refugees from Darfur going to collect firewood. Through experimentation with the appearance of the image, reworking of the color, and the slight altering of the image itself, the artist shows how easily an image and its narrative can be manipulated to express an entirely different meaning. Entitled, 2014, is a set of six accordion-style books with imagery made up of black-and-white press photographs highlighted with red pencil marks. Most are truly gruesome images; the red accentuates the brutality of certain events and the continuity from one type of violence to another, be it political, territorial, ecological, or domestic, among others. In Matter of Perspective, 2016,Bertrand tackles the idea of a kind of geographical etymology or semantics: that the meaning of words or our understanding of certain terms is dependent on more than just the accustomed meaning but rather from where one speaks. For example terms like “emigrant,” “foreign laborer,” or “expat” all have shifting connotations depending on who is interpreting them. Although Bertrand does not want her work to be seen as moralistic or dark, it is hard to escape the feeling of ever-decreasing humanism in the current global atmosphere. Therefore it is encouraging to contemplate her piece Birds Don’t Need a Passport, 2017, that conveys a degree of hope in an indirect way. Drawing one species of bird’s flight route per day, the artist is trying to make us feel the excitement of flight, of movement, of possibilities. There is still freedom in the world greater than ours, and in spite of the restriction man is trying to impose on nature and on fellow humans, there is still a larger universe with logistics and laws stronger than ours. The pattern resulting from the innumerable flights’ records overshadows the coasts, landmasses, and oceans, creating its own “map” of free movements traversing the continents. In the late 12th century Persian theologian Farid Ud-Din Attar composed an extensive poem called The Conference of the Birds (also known as Colloquy or Parliament of the Birds) 5 describing the flight of all the species of birds searching for a rightful king. They have to traverse seven valleys on a long and dangerous journey. Every kind of bird is invited to join – many decline considering the dangers involved, preferring to stay in their uncomfortable but still bearable situation. Many who join, for what is actually the search for truth and justice, perish during the long journey. Those who reach the mountain where the alleged king is believed to live attain the highest degree of enlightenment – they realize that the common journey taught them to respect and help each other and that every one of them possesses the courage, wisdom, and humility of the true leader. The passage to such wisdom is arduous but the rewards far surpass the trials of the effort. 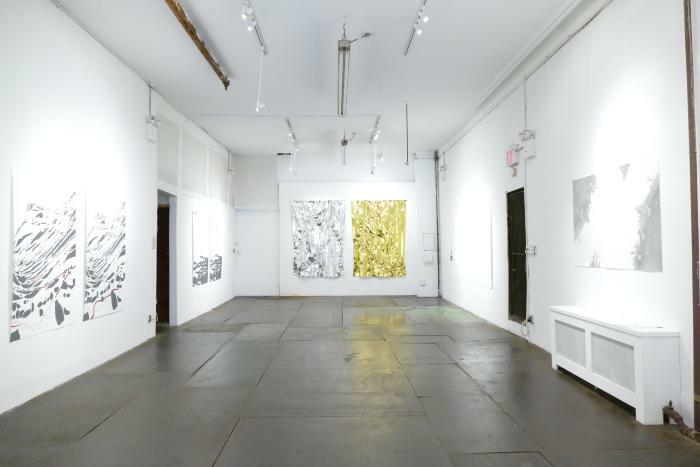 Curator Emerita of Contemporary Art at the Brooklyn Museum and an independent curator based in Brooklyn, NY. 1 Quote taken from emails between Kotik and Lucile Bertrand, July 2017. 2 From Garnette Cadogan, Black and Blue was first published in Freeman's Arrival, then in The Fire This Time, edited by Jesmyn Ward. It was also published as Walking While Black by Literary Hub. 3 Edouard Glissant, Poetics of Relation. Translated by Betsy Wing, Ann Arbor: University of Michigan Press, 1997. 4 Quote taken from e-mails between Kotik and Lucile Bertrand, July 2017. The artist would like to thank all of the participants who shared their stories, Garnette Cardogan for approving the adaptation of his text, Black and Blue, and Toby Gemperle Gilbert for the skillful editing of her texts.